The streamers are what bring all the shoppers to the yard. Dang right. This last weekend we decided to have a garage sale. And I understand the drive to earn a few extra bucks, but when I was solely focused on the money, I didn’t really understand why anyone would want to put themselves through this torture. How horrible this process is of getting everything out of the dusty recesses of your garage, attic, and closets in order to make a few bucks with a whole bunch of people so early Saturday morning. Yuck! However, when I realized that this would be a great opportunity to clear up and clean out the things that are only up taking space in my house and in my mind, then I realized that a clear home equals a clear mind when you’re in the right frame of mind. So let’s get clear and grow more with a couple of examples of why this works. This is something that a lot of people probably don’t realize explicitly, but it is a fact. When you have things that need to get done, there is a percentage of your processing capabilities that is devoted to those things that need to get done, no matter how far you put it back in your mind. Your subconscious mind is always working to solve your problems. Always. You need to use that problem solving resource of yours for the biggest and most important problems in your life, not “how do I clean out my garage, how do I clean out my closet, and how do I clean out my attic?” When you clean those things out and clear them out, then you free up that mental processing power to other more important things. It’s a beautiful thing. Not only are you losing that mental processing power by having these things occupying your mind, it’s also causing a general burden on your ability to get stuff done. You’re being held back from moving on to the future success that awaits you. When you have this feedback loop of, “I need to get this done, I need to get this done, oh, my gosh, that’s a mess,” you’re putting yourself at a disadvantage. Even though you’re not consciously paying attention to it when you have this big pile of junk in the corner, you do notice it every time you pass it by. Maybe only subconsciously, but it is always in your mind. Until it’s taken care of, it will always be a reminder of not getting something done. And let me tell you, you do not want to build a habit of not getting things done. You want to get stuff done. Period. Speaking on junk in the trunk – time to find a match! With that big, gigantic pile of junk over in the corner, you can’t even see what’s possible with that side of the room. You can’t even begin to see what’s possible with the money or the value you get from those items whether you sell them, re-purpose them, or just donate them. You’re not able to free up that extra little chunk of your mind and the power available to you to apply yourself to a more successful future. 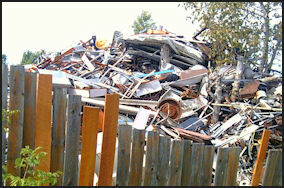 You’re not able to see the vision that stands before you until you knock down that pile of junk. Destroy the wall of junk in your way and see the path ahead. I hope you too can see that a clean home equals a clear mind. When you take a conscious effort to realize that that mess takes up your mental space, it causes subconscious burden, and it stops you from seeing what’s possible in your future. You need to look to the future and the success that awaits you. Go clean out your garage this weekend. 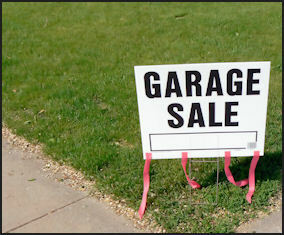 Have a garage sale, makes some bucks, and make your mind free for the things that matter most.